Well no, actually day two. I arrived yesterday and started painting in the evening. My hosts haven't set up their wifi yet ( they also arrived from Arizona) so any posts will be brief until they do. I drive down from Portland to Moab, Utah in one day. 1100 mile all at once. Don't think I'll try to do that on the way back. By the time I hit Moab all the motels were filled so I just headed out into the desert until I couldn't see any other lights, pulled over, and threw down the sleeping bag and slept out under the stars. What an awesome sky. The milky way was bright enough to read by. The next morning I drove into T-ride from the northwest, which took me through some serious back country. I expect people out there think nothing about hopping in the car and driving 70 miles just to fill up the tank. Wide open space. Anyway, here is a photo of me painting in town in afternoon. Doing the obligatory townscapes that are guarantee sellers. 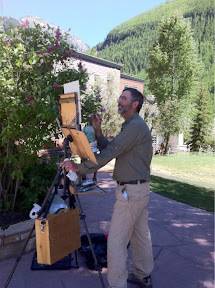 This morning I was painting at 11,300 feet at one of alpine lakes close by. Alpine, of course, around here means 6000 feet higher than at it does at home. Here is a painter friend, Hai-Ou this evening. 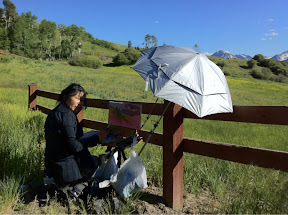 She went back to redo a painting while I started another one up the road. Four painting in the box and the event hasn't officially stared yet. Not bad. Good night, it is dark above Telluride and time for bed. Tomorrow is the official start. I'm tuned in for your reports from the front! Keep them coming...I'm glad you are "ahead of the game" with 4 paintings. What a work ethic!